Isak Dineson takes up the absorbing story of her life in Kenya begun in the unforgettable Out of Africa, which she published under the name of Karen Blixon. With warmth and humanity, these four stories illuminate her love for the African people, their dignity and traditions, and the beauty and wildness of the landscape. The first three were written in the 1950s and the last, "Echoes from the Hills", was written especially for this volume in the summer of 1960, when the author was in her 70s. In all they provide a moving final chapter to her African reminiscences. This is beautifully written. We learn about the land, the people, the animals, and the farm. But very little of Blixen/Dinesen. I don't remember if she relates a single experience with her husband. His presence in the book is that slight. As for the other men in her life, they come across here as nothing more than platonic friends. 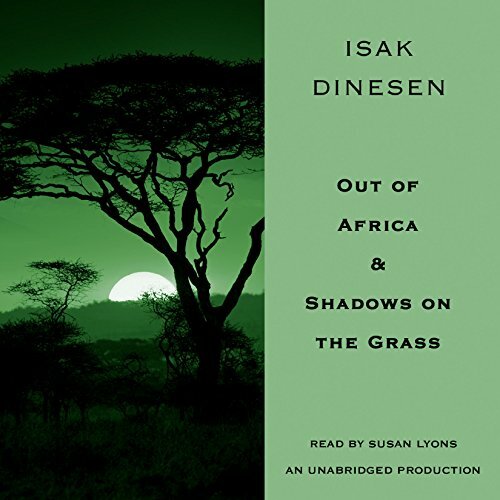 If you want to know what Africa -- well, the part of Africa where Blixen/Dinesen resided -- was like in the early part of the 20th century, this is a must listen. If you're looking for an absorbing narrative -- the print version of the movie -- this will almost certainly disappoint. .
Years ago when I first read her words they awoke in me a desire to remember her and those wonderful people each of whom were her family while she drank in Africa. It has given me much to strive for in my own life and to take in all those I’m blessed to know. This Audible production was a joy as it accompanied me through days of routines, driving and quiet rain. I’m most grateful to have been touched so thoroughly. I downloaded this book to listen on the way to/from the office about 1 hrs. drive. It nearly put me to sleep. I was trying very hard to escape into the story but it was so dry. I didn't complete it. I just couldn't get through the long drawn out chapters. I LOVED the screen adaptation and should have just downloaded that one. Live and Learn. enjoyed every bit of this book. What did you love best about Out of Africa & Shadows on the Grass? described the moon like a silver arch hung on the blue sky. What other book might you compare Out of Africa & Shadows on the Grass to and why? green hills of Africa by Hemingway. Denis was buried in her farm. the book brought my dear memories of Tanzania . It had my heart from page one! I could only hope my own life could be rich. I highly recommend filling your life with these stories! This is such a period piece, written by a titled and entitled European who was nonetheless pretty enlightened for her time and class. The author clearly cares about the people who work on her coffee plantation, and takes pains to adjudicate disputes fairly and equitably. She does her best, within the context of the insane colonialist attitudes in which she and the British colonialist government are steeped, to care for her workers and their families. Yet her continual references to "my houseboys" and "my squatters," and the ways in which she attempts to sum up the attitudes and behaviors of entire tribes based on the few she knows, and the horrifying observations about the mental capacities of certain tribes can't help but be severely cringe-worthy. Her description of and buy-in to some of the repressive laws of British colonial Kenya banning certain Kikuyu dances and making it illegal for the Masai to possess spears, for example, bring to mind the worst and most limited white fear-mongering pith-helmeted petty bureaucrats set on trying to control their subjects. It's painful to consider the ways in which colonial governments of that era messed up tribal boundaries and tribal relations, which had worked fine for millennia prior to the arrival of the rapacious white man. Dineson is at her best when describing wildlife and nature. She has a great eye for the beauty and majesty of the land and its flora and fauna. She is an impressive European female of her era, to be running a farm on her own, killing lions, and working, for a time, running goods for the British government in WWI. Still, this reader, admittedly an animal lover, was nauseated by her wanton killing of wildlife (such as the time she shot an iguana "because I might be able to use its beautiful skin for something" only to discover that its skin turned grey the moment it died). I know those were different times, but the big game hunter mentality is utterly disgusting to me, and there's a lot of that sort of thing in this book. There's only one mention of her husband, who lived in Europe, and much gushing about Dennis Finch Hatton and others. But the book is really a collection of vignettes about the farm, its workers, and nature. I'm glad I listened, but at times it was very painful and I almost gave it up. The narrator has a rather piercing upper-class-sounding English inflection, which didn't help. Still, the beauty of the narrative and the fascination for this out-dated way of life are compelling enough to make me glad I stuck with it. Narrator makes it come alive. A life well told and place that time has forgotten. What would have made Out of Africa & Shadows on the Grass better? A plot. I was waiting for a story line and never got one. It was snapshots from a white snob who observed the Africans as fine animals. What was most disappointing about Isak Dinesen’s story? Would you listen to another book narrated by Susan Lyons? What character would you cut from Out of Africa & Shadows on the Grass? 6 sur 30 personne(s) ont trouvé cet avis utile. The narrator's superb performance almost. makes me believe I'm hearing the book read by the author herself. One of the most elegantly descriptive, beautifully written books of our time.